i only found it i am not the author!! 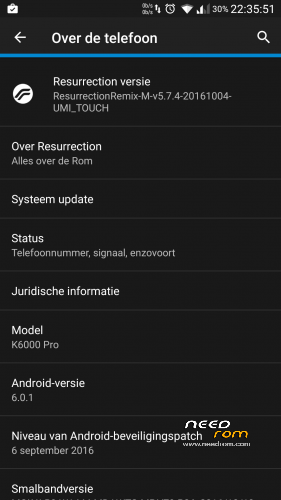 @fv1ede: Have you tried flashing this rom? If yes, are there any bugs? I'm using this rom, it's very nice and almost bugless. The only bug that bothers me is the wifi hotspot that's not working. Otherwise cool rom! I have a problem and it drives me crazy. I tried contacting Oukitel but nobody responds. Do you know about a common problem on android 6.0 about the microphone?? In summary, the setting “noise suppression” for calls doesn’t exist in v6.0, but it’s enabled by default. This causes problems to my phone calls and I would like to turn it off. But first I need someone to update the android and put back that setting. That’s why I’m trying to contact Oukitel. If you have any firmware that solves my problem, can you also give me instructions?? Because I’m a noob at these things. My phone is Oukitel K6000 pro. are you on stock rom now? stockrom has the “noise suppression” setting?? Does this have to be flashed over another rom or a clean install?? I tried clean and over cm13 and I get an error 11 in TWRP as soon as I start flashing… Ideas? could you test youtube? when selecting full hd quality, is there any problem like only a part of the video shown and not full? this problem was in cm13 rom. Every Cyanogenmod Base Rom has the same problem with youtube videos now being shown right. When you select 1080p in youtube quality, the full video won't be shown, only the upper left corner of the video will be shown. 1. Open SP-Flash tool and select android scatter of v12 rom , can be downloaded on needrom. 2. Select the Format-all+download under the download button, make sure at every section like : pre-loader,recovery,etc is a file path attached. (usually happens when you select the Android-Scatter file in every rom zip. the rom must be extracted btw!. 3. press Download. Turn your phone off. connect usb cable from pc to phone. 4. wait until flashing is done. a green icon will pop up. 5. you can now disconnect your phone from the cable. Turn your phone on and skip everything. 5.1 download the RR Rom and copy it to your phone-mikro sd card. 5.3 press multiple times on "Build-Number" or something like that. until a message shows that Developer-Options has been enabled. 5.4 go into developer options and enable "OEM-UNLOCK"
6. Select the newest compatible twrp version for your rom, in our case – V12 twrp. and download it on your pc. 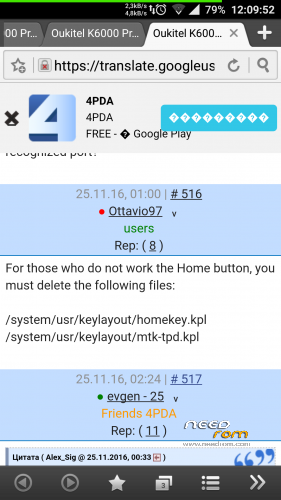 7. go into sp flashtool , Load the Android-Scatter of twrp v12. select "Download Only" under the download button. 8. (your phone should still be turned off, do not turn in on!) . Press download button. connect your phone to the pc again. Wait until the green icon pops up again. If for some reason your phone disconnects, simply repeat from step 1. 9. unplug your phone when the green pop up shows up. Now press Power Button and hold, while also pressing volume up button for 2 secs, and only keep holding volume up and let go of power button. now a small screen will show up. use volume up to navigate to recovery. use volume down button to select it. your phone wiill now restart into recovery mode. 10. Select Install. and search for RR-ROm zip. Install it! 11. Wipe "Dalvik-Cache" and "Cache" . Then reboot. Done!. If you got any questions. ask me. My Oukitel K6000 Pro is currently on V.11 stock rom, TWRP for v.11 installed. I flashed via TWRP the Resurrection v2 above. Flash was done with no issue. Phone reboot fine. But an error pop up, “CM audio service stopped working”. The error caused No SIM card detected. Anybody has the same issue? Or can experts tell what actually is the problem? I really love this ROM from the boot animation to great UI.